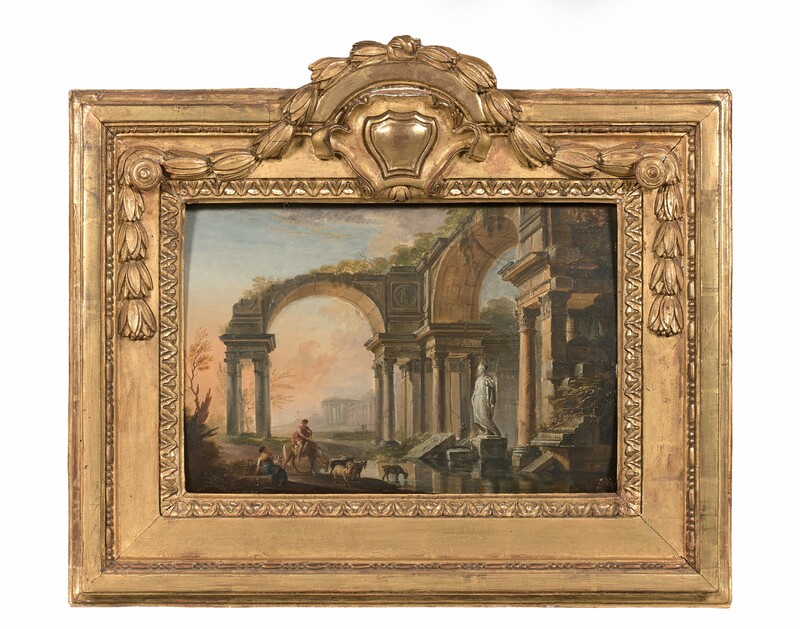 In this charming pair of landscapes Lallemand has taken inspiration from Gian Paolo Panini to illustrate scenes from classical mythology. Although they refer to the past, the landscapes also have an eighteenth century sensibility, with a soft rococo palette and Lallemand’s hallmark feathery foliage. They reflect his experience in Rome, and his study of both the old masters and the classical ruins of the city. 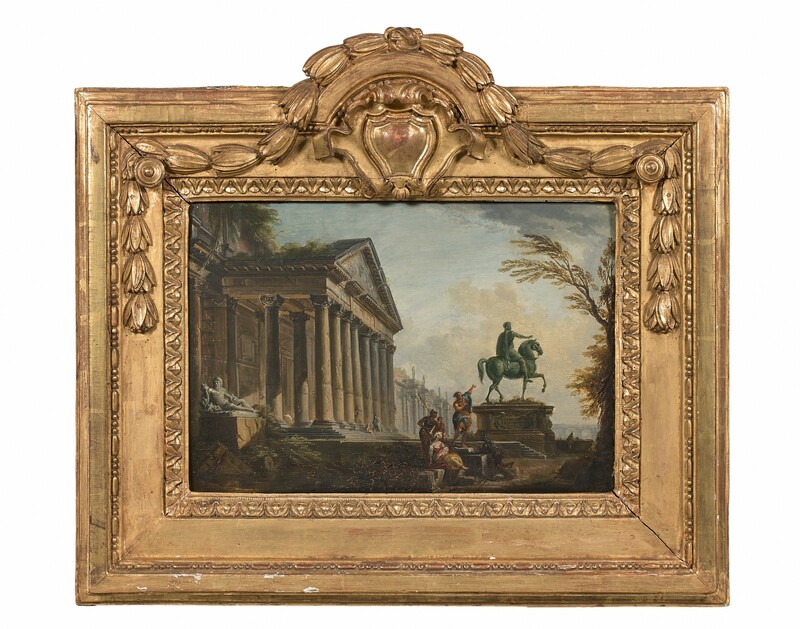 The artist moved to Paris from Dijon in 1739 and studied under the architect, stage-designer and painter Nicolo Servandoni, who was responsible for Saint Sulpice, Paris, and a rival of Panini as a specialist in classical capricci. Although received as a member of the Academie of Saint Luc in Paris in 1745, he was in Rome by 1747, and immediately came within the orbit of another visiting French artist, Joseph Vernet. During Lallemand’s fourteen years in Rome he taught Robert Adam landscape drawing (1755), and executed frescoes and paintings for the Palazzo Corsini and the papal bedchamber in the Palazzo Quirinal. In 1761 Lallemand returned to France via Lyon, but continued to exhibit views of Rome and Naples, as well as architectural fantasies. From 1770 he was in Dijon for three years, working on the Voyage pittoresque de la France which was published in twelve volumes between 1781 and 1796. This provided a charming and topographically accurate record of ancien regime France in the years leading upto the Revolution. By 1786 he had settled in Paris again and was producing more idealised landscapes and marines for the Salon de la Correspondance. His final works were paintings of three events from the Revolution itself (now in the Musee Carnavalet, Paris), an upheaval he survived, albeit unproductively, until the dawn of the empire. Drawing inspiration from the Dutch mastes such as Berchem and Wynants, Lallemand helped to create, along with Boucher and Fragonard, a distillation of the rococo ideal in landscape. His years in Italy gave him a true experience of southern light and atmosphere, which he fused with his memories of the Rhone and the Midi. His seaports are more fanciful than Vernet’s, but his bucolic scenes, despite their strong colouring and feathery trees, strike a more realistic note than Boucher’s. For historical purposes his gouache views of Paris are invaluable documents for the appearance of that city in the 1780’s. In this charming pair of views he revives the spirit of classical antiquity through the gloss of Panini. He is one of the most attractive painters of his generation, and widely represented in museums, among them the Hermitage and the Louvre. I am writing to enquire about "Shepherds with their flocks beneath Roman monuments: the Statue of the Tiber and of Marcus Aurelius, the other Antique Ruins inspired by the Roman Forum; a pair"